The National Ignition Facility’s Advanced Radiographic Capability (ARC), a petawatt-class laser with peak power exceeding a quadrillion (1015) watts, is moving rapidly along the path to completion and commissioning. ARC is designed to produce brighter, more penetrating, higher-energy x rays than can be obtained with conventional radiographic techniques. When complete, ARC will be the world’s highest-energy short-pulse laser, capable of creating picosecond-duration laser pulses to produce energetic x rays in the range of 50,000 to 100,000 electron volts for backlighting NIF experiments. After amplification in the NIF laser, the ARC beams are compressed in the target bay and focused to Target Chamber Center (TCC). The ARC quad of beamlines can provide up to eight backlighters for ignition evaluation. ARC uses up to four of NIF’s 192 beamlines (one quad), propagating two short-pulse beams for each NIF aperture in a split-beam configuration. Staggering the arrival of the eight ARC beamlets onto backlighter targets will produce an x-ray “movie” to diagnose the fuel compression phase ARC will conduct multiframe, hard-x-ray radiography of imploding NIF capsules. Using ARC, NIF researchers will be able to record the physics of targets at 50 billion frames per second. leading up to ignition of a cryogenic deuterium-tritium (DT) target with tens-of-picoseconds temporal resolution during the critical phases of an inertial confinement fusion (ICF) shot. ARC also will enable new experiments in frontier science and high-energy-density (HED) stewardship science. Over the past three years, the ARC utilities, including electrical cabling, vacuum and ventilation systems, platforms, and cleanrooms, were installed, and first light was propagated into ARC compressor vessel 1. 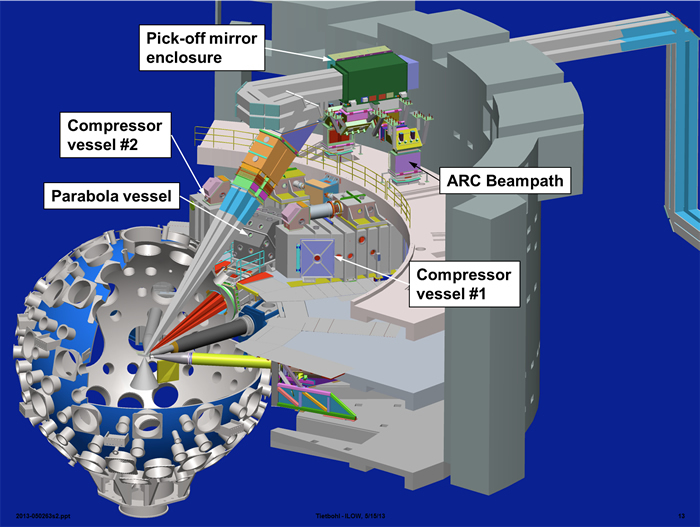 A series of laser shots to the roving mirror diagnostic enclosure (RMDE) calorimeters at the exit of the NIF laser bay operationally tested a subset of the ARC systems, including the ARC injection laser system, Integrated Computer Control System (ICCS) automated shot software, and laser performance operations module (LPOM) shot setup and analysis software. An ARC shot early last year fired 10.41 kilojoules (kJ) of light in four beams (eight beamlets or split beams). The laser shots were performed in parallel with the installation and alignment of the compressor and parabola vessel line replaceable units (LRUs) in the target bay and the ARC short-pulse diagnostics LRUs in the target bay and switchyard. Installation of the last optical LRU, the AM8 transport mirrors in the parabola vessel, was completed in May of 2014. The mirrors direct the converging ARC beams to the backlighters near target chamber center. On May 30, 2014, the team removed all the covers from the optics (gratings and mirrors) in compressor vessel 1. As part of this activity the optic surfaces were inspected and any change in grating alignment caused by handling the covers was monitored. No change in grating alignment was needed and no new features (defects, scrapes, scratches or debris) were noted on the optic surfaces. The first ARC precision pointing shot to TCC, using a single target positioner, was fired in May of this year. The ARC pointing performance for both ARC-AT (ARC beam alignment) and ARC pointing target (actual target) were measured. The system shot fired four ARC beamlets to TCC delivering 200 joules each in a pulse of about 30 picoseconds (trillionths of a second). Two system shots of ARC beam to a target at TCC were performed in June. For the first shot two beamlets from one NIF beam irradiated a target, and for the second shot four beamlets from both ARC beams irradiated a target. X-ray images of the beams on both shots were acquired and no backscattered light from the beams was observed. For the purpose of NIF diagnostics, each of the eight ARC beams will be pointed at up to eight backlighters and staggered in time to provide an eight-frame backlit movie of the target capsule implosion. Simultaneously firing the full ARC quad will give the highest peak intensities on target and enable many HED physics experiments at NIF. Moreover, by coherent addition of pulses from multiple ARC apertures—similar to how modern astronomy uses coherent addition of light from many small mirrors to achieve the focusing resolution and light-gathering power of a much larger mirror—future additions to NIF-ARC may utilize coherent addition of pulses to produce exawatt-class (1018 watt) peak powers and ultra-high focal intensities unachievable from single-aperture lasers. The first petawatt laser was demonstrated at Lawrence Livermore Laboratory in 1996. That laser system was commissioned as a high-intensity beamline in the Nova laser, NIF’s predecessor. The short pulses for ARC will be produced by compressing the laser pulse with gratings in the large ARC compression chamber shown in the photo. The laser produced 1.5 petawatts of power and focal irradiances of about 1,020 watts per square centimeter. Subsequent petawatt laser target experiments yielded several important findings including the discovery of high-energy, laser-driven proton beams, high-energy x-ray radiography and laser-driven nuclear excitation. The success of the Nova laser and the fundamental discoveries in HED science it enabled inspired a revolution in high-energy petawatt laser development around the world. LLNL continues to support and interact with institutions that are building petawatt laser systems to explore HED science (see “Lighting a New Era of Scientific Discovery”). An organization to support petawatt-class laser system research was also created: the International Committee on Ultra-Intense Lasers (ICUIL) furthers the exploration of petawatt laser systems and associated technologies by coordinating meetings and other professional activities that bring together specialists in these areas.